The Federal Reserve signaled a pickup in the economy is keeping it on track to raise interest rates this year, though subsequent increases are likely to be more gradual than anticipated earlier. (Bloomberg) — The Federal Reserve signaled a pickup in the economy is keeping it on track to raise interest rates this year, though subsequent increases are likely to be more gradual than anticipated earlier. “Since the committee last met in April, the pace of job gains has picked up and labor-market gains have improved further,” Fed Chair Janet Yellen said at a press conference in Washington Wednesday after the Federal Open Market Committee voted to keep the main rate at zero, where it has been since late 2008. New forecasts issued by the committee implied two quarter- point rate rises this year but a shallower pace of increases in 2016. 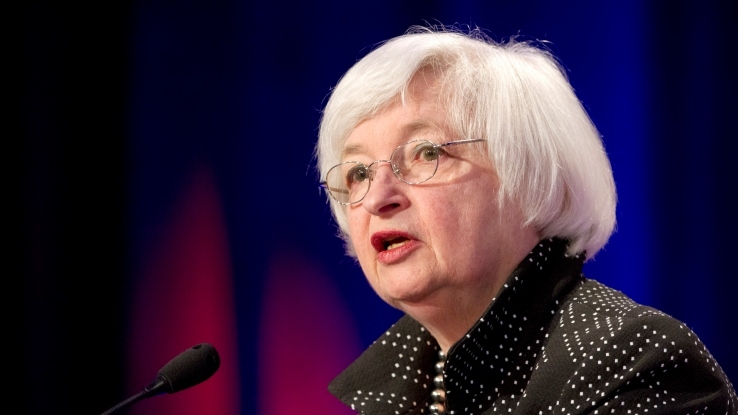 Yellen stressed that the date of the first rate increase is less important than the trajectory of subsequent ones. She said tightening would be “gradual,” and that the Fed wouldn’t follow a “mechanical” formula. “They’re starting from a very low point and they’re going to take it very slowly,” said Brian Jacobsen, who helps oversee $250 billion as chief portfolio strategist at Wells Fargo Advantage Funds in Menomonee Falls, Wisconsin. Stocks rose after the Fed announcements, with the Standard & Poor’s 500 Index up 0.2 percent to 2,100.38 as of 4:01 p.m. in New York. Ten-year Treasury note yields were little changed at 2.31 percent. “The committee continues to judge that the first increase in the federal funds rate will be appropriate when it has seen further improvement in the labor market and is reasonably confident that inflation will move back to its 2 percent objective over the medium-term,” Yellen said. While the Fed has made “considerable progress” toward its goal of maximum employment, “the committee wants to see evidence of some further progress.” She added that inflation will “move gradually back” toward the Fed’s goal as the impact of lower prices of energy and imported goods dissipates. Officials maintained their projection that the benchmark rate would rise to 0.625 percent in 2015, while dropping their forecast to 1.625 percent next year — lower than their March median estimate of 1.875 percent. And while the median forecast for this year was unchanged, seven of 17 members of the committee now project either one rate increase or none in 2015, up from just three in March. “The consensus for a September liftoff lost some votes today, but if the economy outperforms, they are certainly willing to revisit the timing,” said Chris Rupkey, the New York-based chief financial economist at Bank of Tokyo-Mitsubishi UFJ Ltd.
After a slump in March, job growth has rebounded. Employers added 280,000 positions in May, the most in five months. Average hourly earnings accelerated to a 2.3 percent year-over-year pace, the fastest since August 2013. Yellen, in her press confidence, cited labor-market indicators that point to continued slack, such as the number of part-time workers who would prefer full-time jobs. Further wage and job gains could give Fed officials confidence that inflation, which has lingered below their 2 percent goal for three years, is likely to move higher. Fed officials marked down their forecasts for economic growth this year to account for a contraction in the first quarter that was caused in part by temporary conditions such as unusually harsh winter weather and a stronger dollar. “While the committee views the disappointing economic performance in the first quarter as largely transitory, my colleagues and I would like to see more decisive evidence that a moderate pace of economic growth will be sustained,” she said.